The folks at the Southeast Review got jokes. I think…? 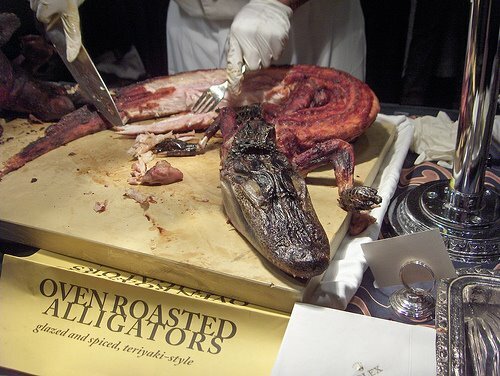 So with Thanksgiving fast approaching, a little Florida flava’s been stirred into the Southernist pot. Eat up! The Southeast Review, established in 1979 as Sundog, is a national literary magazine housed in the English department at Florida State University and is edited and managed by its graduate students and a faculty consulting editor. The mission of The Southeast Review is to present emerging writers on the same stage as well-established ones. In each semi-annual issue, they publish literary fiction, creative nonfiction, poetry, interviews, book reviews, and art. With nearly sixty members on its editorial staff who hail from throughout the country and the world, SER strives to publish work that is representative of its staff’s diverse interests and aesthetics, and it celebrates the eclectic mix this produces. Aw, shoot! Thanks for the feature! Sorry it took us this long to check up on it.By the by, it was little Betty Ann Leftknuckle who bagged this year’s gator. We all ate well on Thanksgiving, although there was a knock-down brawl over who prepared the best pie: Elizabeth Stuckey-French’s traditional apple, Barbara Hamby’s key lime, or Diane Roberts’ orange meringue whiskey surprise.